Yolanda Sauceda Jaramillo obituary. Carnes Funeral Home. 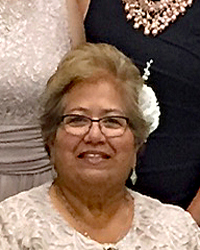 Yolanda Sauceda Jaramillo was called to her home in Heaven on Wednesday, August 22, 2018, after a brief and courageous battle with illness. She was a woman of faith and trusted God with her life. At the moment God transitioned her from this world to Eternity, she was peaceful and calm. Her family surrounded her, praying and singing worship songs, as she stepped into the loving arms of Jesus. 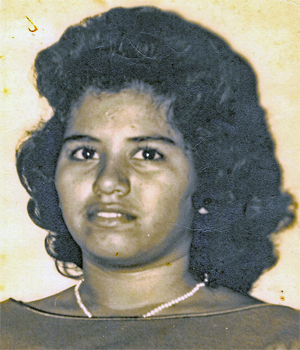 Yolanda was born on August 20, 1945, the third of five children to the marriage of Ponciano and Sofia Sauceda, in Corpus Christi, Texas. She was raised in Freddiesville (Hitchcock), TX. 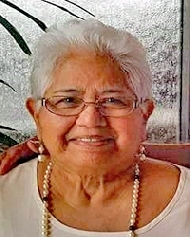 She and her husband, Francisco, were married in 1966 in Texas City, TX, where they settled and raised their five children. Yolanda professed her faith in Christ at an early age. She attended Bible school for a time and was active in church activities all of her life. She was a dedicated wife and mother, happily doing everything she could for her children, grandchildren and the love of her life, Pancho. You could say that Yolanda was gifted in her ability to cook, decorate cakes, sew, and do needlework, puzzles and word search puzzles. She could make something delicious from whatever was in her kitchen at the time, not even using a recipe. She was a master at making authentic Hispanic favorites, such as enchiladas, picadillo, menudo, posole, empanadas, capirotada, buñuelos, and flour tortillas. Of course, who could forget her tamales – they were delicious and truly made with love. 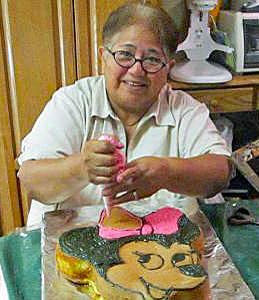 Countless birthdays, weddings and quinceañeras (especially those of her children and grandchildren) were graced by cakes she decorated. Amazingly, she decorated with her left hand even though she was right-handed, as the person who trained her was left-handed. She sewed for her friends and family, many times out of necessity, often for special occasions, and always with joy. As evidenced by her small collection, she believed one could never have too many sewing machines. No job was too big nor too small. If you had a ‘stitch’ emergency, she would be the person to go to. Her hobbies were where she found solace and one of the ways she expressed her patient and tender spirit. Yolanda also enjoyed being in the driver seat…literally. She preferred to drive herself anywhere (or at least be allowed to sit in the front seat), near or far and especially to garage sales and thrift stores. After all, where can you get so much stuff on a fixed income? She was a person who gave generously, freely giving what she had freely received. Few have such a great heart. There was always room in her heart, her life and her home, to help anyone in need. She had many friends and acquaintances, always finding someone to chat with wherever she went. Yolanda overcame every obstacle that arose, including many medical challenges, throughout her life. She would put a smile on her face, her faith in Jesus and always found an open door and a new opportunity. No matter the circumstance, she never gave up on herself, her children, nor her Lord. It was difficult to see her face the challenge that stepped in front of her on July 4th. She had beaten the odds time and time again, but this time was different. Her family rallied around her and stood in the gap in every way possible. There was no way they would let her face this alone. She was very brave but in the end, her strength simply could not keep up. Her words were minimal, but we knew she placed her trust in God and would accept His will, whatever that might be. Peacefully and beautifully, she made her way to Heaven. Yolanda is preceded in death by parents, Ponciano and Maria de los Angeles “Sofia” Villanueva Sauceda and brother and sister-in-law, David and Virginia Sauceda. 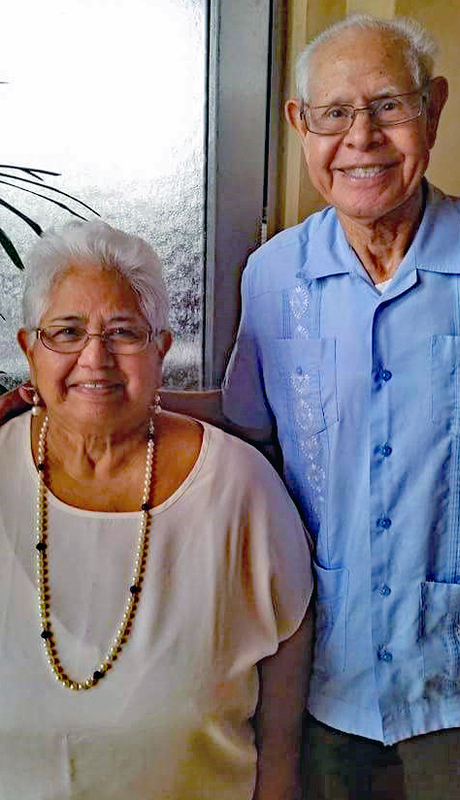 Left to cherish Yolanda’s memory is her husband of 52 years, Francisco Jaramillo, Sr.; children, Moises Jaramillo and wife, Alma; Francisco Jaramillo, Jr., and wife, Inna; Yolanda Gutierrez and husband, Mario; Ezequiel Jaramillo and wife, Beth; Amos Jaramillo and wife, Martha; grandchildren, Karla, Miguel, Alexis and Alex Jaramillo; Karina Rodchenko; Monica and Samantha Gutierrez; Gabriella and Madelyn Jaramillo; Makayla and Anabelle Jaramillo; siblings, Laura Sauceda Villagran and husband, Javier; Daniel V. Sauceda Sr. and wife, Zelma; Dario Sauceda and wife, Gusti; twin aunts, Enriqueta Molina and Josefina Silva, as well as numerous nephews, nieces and extended family members. Serving as Pallbearers are Moises and Amos Jaramillo, Chris Garza, Daniel V. Sauceda, Jr., Beto Flores, and Mike Montez. Honorary Pallbearers are Miguel and Alex Jaramillo, and Robert Gabriel Garza. Guests are invited to share in a Celebration of Life Visitation from 5-8:00 p.m., on Friday, August 24, 2018 at Carnes Funeral Home, 3100 Gulf Freeway, TX 77591. Funeral Services will be 10:00 a.m., Saturday, August 25, 2018 at Carnes Funeral Home -Texas City with Interment to follow at Grace Memorial Park Cemetery in Hitchcock, Texas.